There is only one movie that I have seen (and paid for) in theaters more than 6 times. That movie is Titanic (1997). Over a decade ago, in 1997, I was just a 9-year-old, third grade girl desperately in love with J.T.T. But, the first time I laid eyes on Leonardo DiCaprio in the Titanic trailer, the drool hanging off the bottom of my lip told me that J.T.T and I were over. There was a new man in my life. Leo and I have been together ever since. With the recent release of James Cameron’s Avatar (2009) and the weekend release of Scorsese’s Shutter Island (2010) it is clear that, despite 13 years of aging, the Titanic alumni are still very relevant to Hollywood today: Kate Winslet took home an Oscar last year for her performance in The Reader (2008). DiCaprio has been nominated for two Academy Awards, post Titanic, and has had the starring role in stellar films like The Departed(2006 ), Blood Diamond (2007 ), Gangs of New York (2002 ), and Catch Me if you Can (2002). Bill Paxton stars in his own show on HBO, Big Love. And Lord knows Kathy Bates hasn’t gone anywhere. In fact, the whole cast of Titanic’s careers seem to be unsinkable, with the exception of Billy Zane. In Titanic, Billy Zane played Rose’s aggressive and possessive boyfriend Cal. His hairless head and extremely fit body made him easy to spot among the Hollywood crowd in various award shows, but as far as the Big Screen is concerned, Billy Zane has just been blending in. Post Titanic, the Chicago native has been playing mostly small supporting roles in a series of B-movies and Television shows, most notably as Winston Funk, Christina Applegate’s ex lover on ABC’s Samantha Who?. Although his face has not appeared on the Big screen his voice has been flooding the airwaves of children’s movies, he was the voice of John Rolf in the Disney sequel; Pocahontas II: A Brave New World, and in video games in SSX Tricky as Broderick ‘Brodi’ Ford and again as Ansem in Kingdom Hearts. Currently Billy Zane has bit parts in 4 movies scheduled to be released late this year: 4Chosen, The Roommate, Enemies Among Us, and The Confidant. I, for one, am ready for Mr. Zane to get the lead role he deserves. Billy I miss your shimmering scalp, your ability to embody evil and your sinfully seductive left side smirk. p.s. 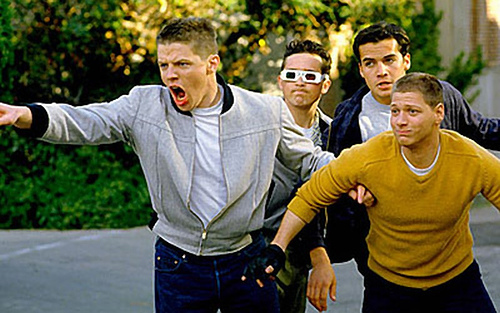 Interesting fact: Zane first appeared on the Big screen as one of Biff’s henchmen in Back to the Future(1985).